Sublimation printing is the process of putting your own designs onto a special, transfer paper which is then heat-pressed over the top of the garment and the design is transferred onto the product. Sublimation printing only works on 100% white polyester garments making it the perfect printing technique for running tops, vests, shirts and any other polyester sports clothing that requires a soft print finish. 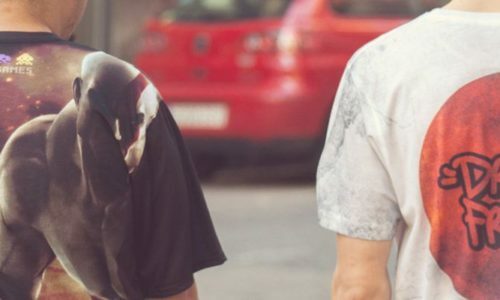 The quality and the impact of all over printed T-Shirts is amazing – they are the perfect garment for standing out from the rest of the crowd. With no minimum order quantity and prices from around £6.95 per T-Shirt, you can create your own fashion brand and start making a profit from your own printed designs. See how Drawn Fresh did just that with their sublimation T-Shirts. We offer T-Shirt printing samples, colour swatches and blank samples so that our clients can see and touch their selected products before going ahead with the order. Find out about dye sublimation printing samples here. Due to the printing process for dye sublimation, it is normal that the print leaves white marks where there are creases. These white marks are commonly found around the armpit area. The garment must be made of white polyester for standard dye sublimation. Please be aware that a true black can not be achieved with dye sublimation as the T-Shirts can only absorb a certain amount of ink. Therefore, black can often not be as saturated as some other colours and may appear off-black. Dye sublimation is primarily suited to all over randomly placed designs, not position specific designs but please contact us if you have any doubts. Printed garments are more sensitive and need extra attention when it comes to washing. To preserve the print and the garment, it is recommended that you wash it inside out on a cold wash.